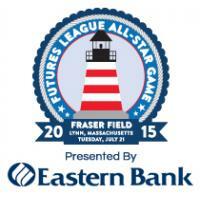 LYNN, Mass., March 24, 2015 - Eastern Bank has signed on to be the presenting sponsor of the Futures Collegiate League All-Star game, which will be held on July 21, 2015 at Fraser Field in Lynn. The NORTH SHORE NAVIGATORS will host the game, which will include a performance throughout the game by the ZOOPERSTARS - the nationally famous and side splitting inflatable characters that have been entertaining sporting crowds for two decades. This will mark the entertainment group's first-ever appearance in Lynn. "We are so excited to host the game and to be able to showcase Historic Fraser Field - celebrating its 75th season of baseball - and to have Eastern Bank join us in these efforts is outstanding," said Pat Salvi, Navs owner. The Futures League is a New England based "collegiate summer" league that features players from around the country but with a focus on New England bred players. The best of the best will descend upon Lynn for the July 21st showcase presented by Eastern Bank. The first pitch is at 7:00 pm and tickets will be on sale in early May. To learn more, please visit: www.nsnavs.com.